Vicia bivonea Raf., Vicia dasycarpa Ten., Vicia eriocarpa (Hausskn.) Hal., Vicia pseudocracca Bertol., Vicia varia Host, Vicia varia var. eriocarpa Hausskn., Vicia villosa subsp. dasycarpa (Ten.) Cavill. Hairy vetch (Vicia villosa Roth) is an annual or biannual viny legume with a woolly appearance due to long soft hairs borne on the stems and leaves (FAO, 2014; Cook et al., 2005; Undersander et al., 1990). It remains green longer than the common vetch (Vicia sativa). It flowers and seeds late in the season and often survives the dry season, regenerating to almost full strength during the next rainy season (Göhl, 1982). Vicia villosa has a scrambling and prostrate habit when young. It is 30-70 cm in height in mature swards (Cook et al., 2005). When it is provided with support for upright growth, hairy vetch may climb and reach a height of 1-2 m (Hannaway et al., 2004). It has a shallow taproot that goes no deeper than 1 m, and strong lateral secondary roots. The plant produces 3 to 10 slender stems, that are finely ridged and carinate to angled in shape. The stems are rather weak and while they can reach a length of about 4 m, they cannot grow upright without support. The leaves are alternate, pinnately compound, bearing up to 10 pairs of leaflets. They bear a terminal tendril, essential for their climbing habit. The leaflets are narrowly oblong, 10-25 mm in length (Hannaway et al., 2004). Inflorescences are 7 cm long, spike-like racemes that bear 10 to 20-30 flowers (Cook et al., 2005; Hannaway et al., 2004). The flowers are papillonaceous, purple to blue and sometimes white in colour, up to 1 cm in length and 7 mm in diameter (Tenaglia, 2014). Hairy vetch fruits are elongated, finely haired, fawn coloured dehiscent pods. Each pod contains 4-8 globular seeds, blackish brown in colour and 3-5 mm in diameter (Cook et al., 2005), smaller than those of common vetch (Hannaway et al., 2004). Vicia villosa is appreciated as a cover crop and green manure (see Environmental impact below) (SARE, 2008). In the USA, it is used for soil improvement along roadsides and for bank stabilization (Undersander et al., 1990). Hairy vetch is also used as fodder and can be grazed, or cut for hay and silage. It is commonly grown with a small grain crop (rye, wheat or oats) or with annual ryegrass to provide good quality forage (Hannaway et al., 2004). However, hairy vetch forage and its seeds are known for their potential toxicity to livestock (see Potential constraints on the "Nutritional aspects" tab). Hairy vetch is native to Southern Europe, the Mediterranean Basin and Western Asia. It is naturalized in most temperate, subtropical, and tropical regions of both hemispheres. Hairy vetch was introduced into the USA in the 18th century and is now the most cultivated vetch species in this country. In Europe, hairy vetch is less cultivated than common vetch (Undersander et al., 1990). Vicia villosa naturally grows in waste grounds, disturbed areas, roadsides and banks, as well as in cultivated fields (Cook et al., 2005; Hannaway et al., 2004). It can grow on bare soils and may be considered a pioneer species (Cook et al., 2005). Hairy vetch is a fast-growing summer legume found from 30 to 50° in both hemispheres, from sea level to an altitude of 3000 m (Cook et al., 2005). It does well in areas with average temperatures ranging from 8°C to 19°C. It is relatively winter hardy but tolerates frost better if it is protected by a snow cover or if it is grown with a companion crop, or sown below a cover of crop residues (Undersander et al., 1990). Hairy vetch does well in areas where annual rainfall is 350-1000 mm. It has medium tolerance of drought but cannot withstand waterlogging. Hairy vetch prefers full sunlight. It does well in many types of soil provided they are well drained. It grows in soils with pH ranging from 6 to 7.5 and it is more tolerant to soil acidity than many forage legumes. Hairy vetch has no tolerance to high levels of Al3+ but can withstand moderate salinity (Cook et al., 2005). Hairy vetch is a high yielding forage legume. It can produce up to 12 t DM/ha from two cuts in Australia (Cook et al., 2005). In Spain, hairy vetch without N fertilizer had a higher yield (6.5 t/ha) than a vetch-oat mixture (FAO, 2014). Hairy vetch can be sown in mixture with grasses (in Australia: Digitaria eriantha, Lolium multiflorum, Panicum coloratum, Phalaris aquatica and Setaria incrassata), with small grain crops (rye, wheat and oats) and with other vetches or medics (Cook et al., 2005). Depending on the climate and the intended use, hairy vetch can be sown during late summer (cold areas), or mid-autumn (warmer areas), or year round in places where temperatures are suitable (high altitude tropics), provided there is enough moisture (beginning of the wet season) (Hannaway et al., 2004; Undersander et al., 1990). Hairy vetch can be sown during spring to provide abundant biomass before summer heat. The seedbed should be moist, firm and uniform. The seeds can be drilled at a depth of 2-4 cm or broadcast and subsequently disked to incorporate them in the soil. Though it requires a relatively weed-free seedbed, hairy vetch has some allelopathic properties that reduce weeds (Hannaway et al., 2004). Hairy vetch grows vigorously and can be grazed from the 10-15 node stage through to flowering. Later grazing should not be allowed as the seeds can be poisonous to livestock (see Potential constraints on the "Nutritional aspects" tab) (Cook et al., 2005; Hannaway et al., 2004). Hairy vetch does not withstand heavy grazing, which tends to remove axillary buds and hamper regrowth (Hannaway et al., 2004). Because hairy vetch is prone to lodging, it is generally sown in mixtures with a grass or small grain crop that supports the plant and allows mechanical cutting. Rye is commonly used for that purpose in the USA, though hay made of rye and hairy vetch is tangled and difficult to handle (Undersander et al., 1990). The ideal time for cutting is a trade-off between quality (high protein) and yield. If the crop is cut at the onset of pods in hairy vetch, rye quality has already declined. If it is cut at optimal quality for rye, hairy vetch is still young and yield is reduced (Hannaway et al., 2004). Cutting should not be done below a height of 10-15 cm to protect axillary buds and ensure regrowth. Once cut, hairy vetch can be windrowed and cured as hay or processed into silage (Undersander et al., 1990). 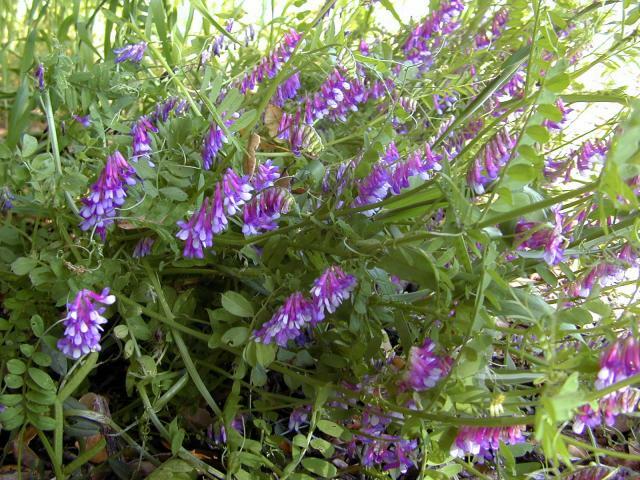 Hairy vetch is a much appreciated legume as a cover crop and green manure. Sown during late summer or mid-autumn, it rapidly provides cover and large amounts of N to the soil. Hairy vetch provides sufficient N for many vegetable crops, partially replaces the need for N fertilizer for maize and cotton, thereby increasing yield and N efficiency of the cash crop. Root development during winter is beneficial to soil structure, as it increases soil capillarity while reducing lixiviation and compaction. Hairy vetch improves biological activity in the soil. It is a P scavenger and reduces excess P in the soil (SARE, 2008). Hairy vetch is a very good source of pollen and nectar for honey bees, which forage readily on its flowers (Weaver, 1965). Hairy vetch readily resumes its growth during spring and, combined with a tendency to allelopathy, the stand smothers spring weeds efficiently (SARE, 2008). A mulch made from rye, crimson clover (Trifolium incarnatum) and hairy vetch can control weeds for between 6 and 8 weeks (SARE, 2008). Hairy vetch forage is rich in protein, from 19 to 30% DM. Crude fibre is in the 17-28% DM range. The hay is slightly less nutritive. Hairy vetch straw contains about 10% protein in the DM. The seeds and vegetative parts of hairy vetch can be poisonous to livestock, including cattle, horses and poultry, but the etiology of the toxicity remains elusive (Cooper et al., 1984; Anderson et al., 1983; Kerr et al., 1982). In cattle, the consumption of hairy vetch has been linked to a systemic granulomatous disease. Three different syndromes have been reported. The first syndrome, associated with the ingestion of hairy vetch seeds, resulted in acute nervous derangement, pain, convulsions and death (Claughton et al., 1954). A second syndrome, associated with consumption of hairy vetch pasture, resulted in death of cattle with signs that included subcutaneous swellings of the head, neck and body, eruptions in the oral mucous membranes, purulent nasal discharge, cough, and congestion. The third syndrome, also associated with consumption of vetch pasture, is characterized by dermatitis, conjunctivitis and diarrhea, together with lesions that include extensive infiltration of organs by monocytes, lymphoplasmacytic cells, multinucleated giant cells, and eosinophils (Panciera et al., 1992). Post-mortem findings showed severe bronchitis with pneumonia, yellow-brown liver, and inflamed forestomachs (Panciera et al., 1992; Cooper et al., 1984). Poisoning has been reported in one horse grazing hairy vetch: symptoms included oedema, especially around the lips and eyes, conjunctivitis and corneal ulceration (Anderson et al., 1983). In poultry, a diet containing 30-80% hairy vetch seeds caused a mortality rate of 20-40% (Cooper et al., 1984). However, in practice, hairy vetch forage is often fed to ruminants. In an attempt to induce the disease in 3-year old Hereford cattle by including 100% hairy vetch in the diet for 5 weeks, no signs of morbidity or mortality were seen. Animals older than 3 years may be more susceptible to the disease, which could be due to an acute reaction following a previous contact with the plant (Panciera et al., 1992). In the case of horse poisoning reported above, only one horse out of the 8 grazing hairy vetch was ill, and there were no previous reports of horse poisoning (Anderson et al., 1983). Hairy vetch was found to contain L-canavanine, an amino acid that protects plants from predators but also reduced feed intake in pigs (Enneking et al., 1993). Hairy vetch can be grazed, especially in annual legume-grass and/or legume-cereal mixtures. It can also be offered as hay or silage to supplement cereal or grass based diets. Hairy vetch is not very palatable to livestock (SARE, 2008). When compared to several clover species (Trifolium incarnatum, Trifolium vesiculosum, Trifolium nigrescens, Trifolium hirtum) in cafeteria-style trials with goats, hairy vetch was shown to be of intermediate palatability (Terrill et al., 2004). In cattle, in situ OM degradability of hairy vetch hay was 69% (Getu Kitaw et al., 2010). In rams, in situ DM degradability of hairy vetch straw was between 59 and 61% (Bruno-Soares et al., 1997; Abreu et al., 1998; Bruno-Soares et al., 2000). Voluntary intake of hairy vetch hay in rams was 71 g/kg LW0.75, OM digestibility was 50% and ME was 6.6 MJ/kg DM (Abreu et al., 1998). In a Finnish organic dairy system based on pasture associated with Italian ryegrass (Lolium perenne) and barley, hairy vetch was better utilized than common vetch (Vicia sativa) for extended grazing, and produced more herbage. Dairy cows grazing hairy vetch produced a similar amount of milk as cows grazing Persian clover (Trifolium resupinatum) (20.6 vs. 22 kg/d), in spite of the lower in vitro OM digestibility (74 vs. 78%) and sugar content (8.6 vs. 13.6% DM) of the hairy vetch. Unlike clover, hairy vetch did not cause bloat (Kuusela et al., 2004). In Ethiopia, hairy vetch hay fed to lactating dairy cows replaced up to 50% of a concentrate mix without changes in feed intake, nutrient digestibility, milk yield and milk composition. DM digestibility and ME intake were higher in diets including 50% of hairy vetch hay than for diets containing 25% or 75% hay (Getu Kitaw et al., 2010). In Mexico, a silage of hairy vetch (Vicia villosa) intercropped with perennial ryegrass (Lolium multiflorum) used to supplement dairy cows on restricted grazing resulted in similar productivity as maize silage, but the economic return was 9% lower (Hernandez-Ortega et al., 2011). In the USA (Oklahoma), stocker cattle grazing tall fescue (Festuca arundinacea) and a legume mixture including hairy vetch had average daily gain (700 g/d) and total gain (296 vs. 237 kg/ha), comparable to cattle grazing fertilized fescue. However, after 3 years, the fescue-legume pasture showed a tendency toward a lower than expected net return compared to the fertilized system (Interrante et al., 2012). In Finland, supplementing growing dairy bulls with a silage made of hairy vetch and whole crop barley, replacing a moderately digestible grass silage, resulted in similar growth performance and carcass characteristics, but supplementing with a hairy vetch-whole crop wheat silage decreased carcass gain due to lower energy intake and poorer feed conversion (Huuskonen et al., 2010). In China, a concentrate feed with 40% hairy vetch was shown to improve the meat quality of hybrid beef cattle, but it is unclear whether the seeds or the foliage were included (Han et al., 2012). In Pakistan, sheep grazing hairy vetch pasture had the same DM intake as sheep grazing barley pasture during the pre-flowering stage, but DM intake and weight gain were lower for vetch during the flowering and mature stages (Shahid et al., 1993). In Australia, sheep grazing hairy vetch (1 sheep/10 kg available DM) showed higher daily gains than sheep grazing oat pasture (146 vs. 92 g/d) (Spurway et al., 1974). In Kenya, hairy vetch hay given to sheep (127 g DM/d) as a protein supplement to fresh Sorghum x almum forage resulted in higher DM intake, protein intake, average daily gain and feed efficiency ratio than feeding Sorghum x almum alone (Lanyasunya et al., 2007d). In another trial with fresh hairy vetch, the same authors found that while Vicia villosa had potential as a protein supplement for ruminants fed low quality feeds, its proportion in the diet should not exceed 20% (fresh matter basis), as higher rates reduced intake and VFA concentration (Lanyasunya et al., 2007c). There is little information about the utilisation of hairy vetch in pig feeding, possibly because of expected deleterious effects on animal performance. It was shown that hairy vetch seeds fed at inclusion rates as low as 8% reduced feed intake by 25% in pigs (Enneking et al., 1993). No recent information could be found regarding the use of hairy vetch seeds in poultry diets (October 2014). In an early trial, feeding hairy vetch seeds to chicks resulted in mortality when included in the diet at 10% and also in decreased performance at 20 and 30% of the DM. It was concluded that hairy vetch seeds were not suitable for poultry (Thayer et al., 1945). In a later study, diets containing 30-80% hairy vetch seeds caused 20-40% mortality in poultry (Cooper et al., 1984). Hairy vetch has been considered as a potential forage for wild rabbits in Utah, USA (Surrency et al., 2001). However, in Brazil, including hairy vetch seeds (5 g/kg LW) or leaves (1.5 to 4.5 g/kg LW) in the diet was shown to cause intoxication in domestic rabbits (Sonne, 2010). For this reason, the use of any part of the hairy vetch plant is not recommended for feeding rabbits until new information is available. Cooper, M. R. ; Johnson, A. W., 1984. Poisonous plants in Britain and their effects on animals and man. Great Britain Ministry of Agriculture, Fisheries and Food Reference Book, 161. H. M. S. O.
Sonne, L., 2010. 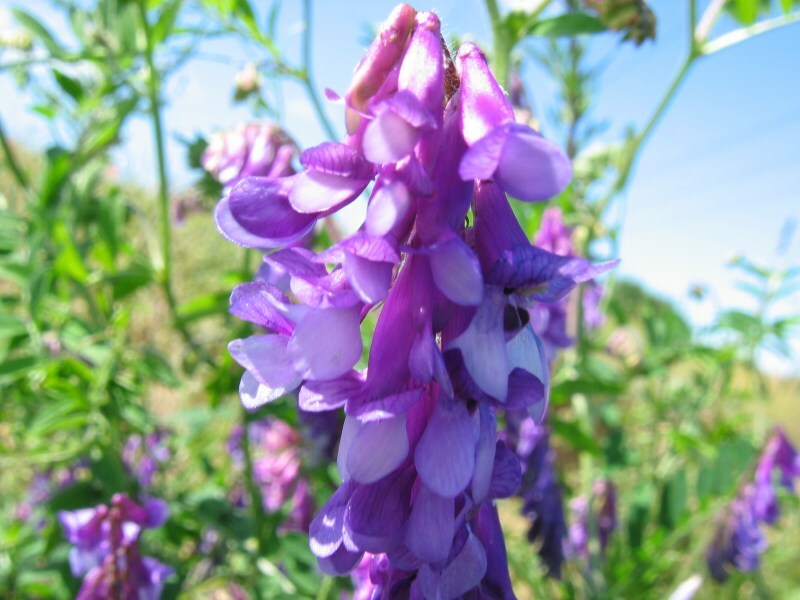 Experimental and natural intoxications by Vicia villosa in rabbits and cattle. Doctoral Veterinary Thesis, Universidade federal do Rio Grande Do Sul - Brazil, 103 p.
Weaver, N, 1965. The foraging behaviour of honey bees on hairy vetch III: Differences in the vetch. lnsectes Sociaux, 12 (4): 321-326.